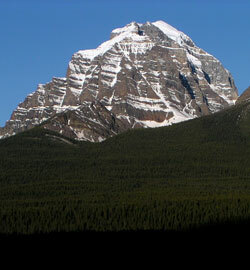 Clearly the most massive and the highest of the mountains of the Lake Louise area, Mount Temple is the first of the high peaks near the Continental Divide which one sees driving west along the Trans-Canada Highway. 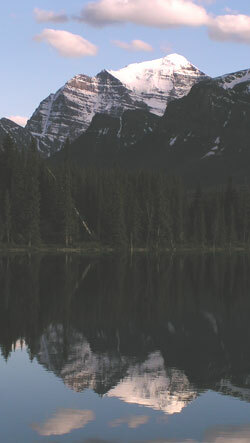 The view of the mountain from the vicinity of Castle Junction was described by Samuel Allen when he read an account of his first ascent of the mountain to the Appalachian Mountain Club in Boston on March 12, 1895. 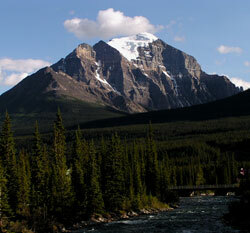 "One who travels west from Banff up the valley of the Bow will see in front of him, shortly after leaving Cascade Siding, a tall helmet-shaped peak rising in a series of inaccessible cliffs to a snow tipped summit. But it is not until Laggan is reached, and the western face of the peak is seen -now to the southeast -that its height or beauty is adequately realized, although from all points it dominates the landscape." 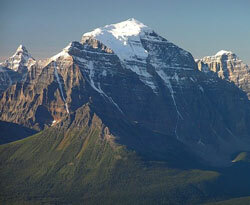 Rising directly from the Bow Valley, the mountain offers three quite different views to the traveler, each of which features huge, steep cliffs. 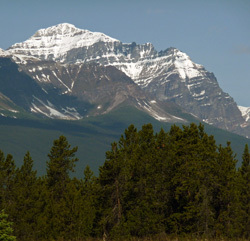 The view from Castle Junction makes clear the fact that this is a mountain different in height and character from those to the east. 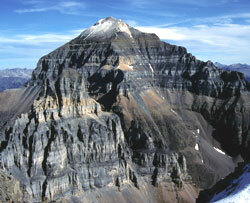 Looming 719 metres above Panorama RidgeWalter Wilcox, Samuel Allen, and L.F. Frissel made the first ascent of Mount Temple utilizing the southwest ridge. 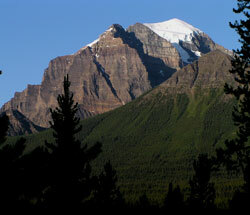 Despite the mountains inaccessible appearance from the various viewpoints in the Bow Valley, this so-called "Tourist Route" is of such difficulty that Ken Jones, the first Canadian born alpine guide, claimed that it is possible to "lead a milk cow to the top." Ken was of course joking, but technically it is an easy climb. 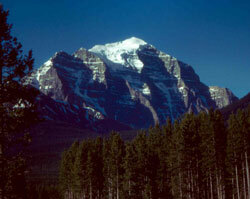 However there are risks involved both from falling rock and, if the route is lost, steep cliffs and avalanches. 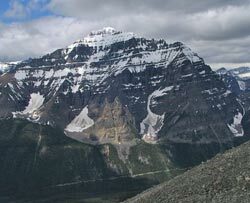 In 1955 seven young people from the United States were killed on this route in Canada's most costly mountaineering accident. 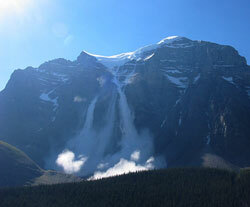 A group of eleven were climbing up a huge bowl on the southwest slopes of the mountain on a very warm July 14th. Ten of the boys were swept 200 metres down a snowfield and though a bottleneck before the snow stopped and set up like concrete. 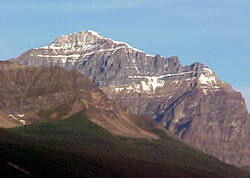 The cliffs of the north face of Mount Temple were not climbed until the 1960's. 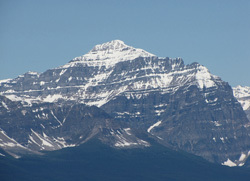 When viewed from the north and north-northwest (along Highway #93) a striking, steeply-dipping line of snow is seen connecting with the east ridge of Mount Temple about halfway up the mountain. 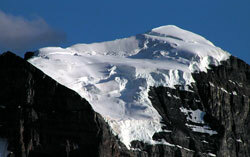 This snow-highlighting is not related to the bedding planes but is formed from snow gathering in what is known as the Aemmer Couloir. Guide Rudolph Aemmer led Val Fynn up this route in 1918 in what Chic Scott describes as, "a serious attempt on this ridge from Paradise Valley." 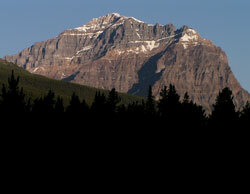 The pair reached the base of what is known as the "Black Towers" at the top of the couloir. 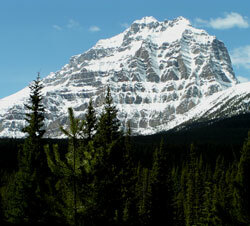 Although there has been considerable confusion regarding the history of the naming of this spectacular mountain, including speculation that it was once referred to as Mount LefroyGeorge Dawson in the early 1880?s. 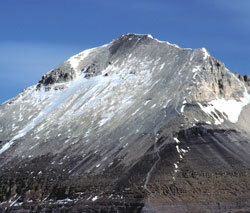 He officially named the peak in honour of Sir Richard Temple, an economist who was the leader of a "British Association" field trip to the Canadian Rockies in 1884. 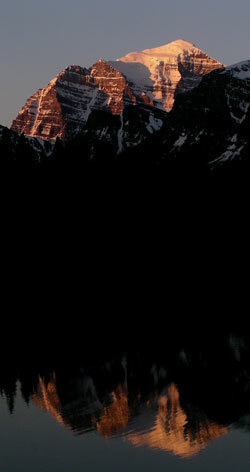 Primarily interested in India, this was Sir Richard's only visit to Canada. 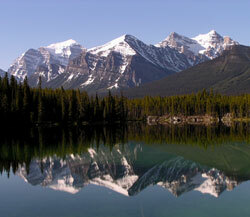 George Dawson was working in the area during 1884 but it is not known whether the two met there. 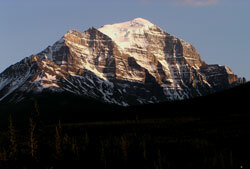 Perhaps they did and somehow Sir Richard made an impression on Dawson who then chose to name one of the most spectacular peaks in the area in his honour. 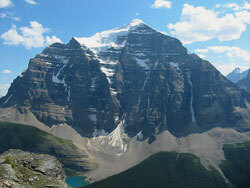 For a panoramic view from the summit of Mount Temple visit www.canadasmountains.com.